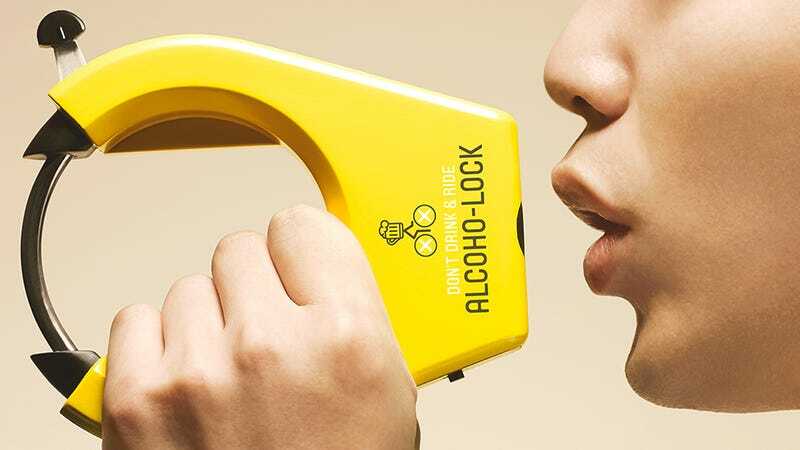 Unlike breathalyzers installed in cars, which are often required by the law after a driver has been arrested for drunk driving, the Alcoho-Lock is completely optional to use. And for those times when you haven’t been drinking, like when leaving for work in the morning, having to lean down and blow into the lock’s breathalyzer is a little inconvenient. So convincing people to use it all the time, or carry two locks depending on the time of day, might be a hard sell. But if you know your evening will be filled with plenty of libations, and you’re worried about your ability to balance on two wheels to get home afterwards, using the Alcoho-Lock, while your head is clear, isn’t a bad idea. And if the lock’s breathalyzer does detect you’ve been drinking excessively, it doesn’t necessarily mean your ride is locked until you sober up. It will also automatically send a message to a friend or partner’s smartphone letting them know you’re drunk, but also giving them the authority to unlock your bike at any time. A smartphone with an active data connection is required to take full advantage of the Alcoho-Lock, and the device does need to be regularly charged, administering about 40 blood-alcohol-level tests on a full battery. There is one other unfortunate factor that could prevent the widespread use of this device, though: its price tag. At around $250 it’s an expensive alternative to manual bike locks, and few people who really need one with a built-in breathalyzer will be open to the idea.